I’ve been sharing the videos and visuals from the Dark Horse Entertainment live-action series “The Umbrella Academy” so I will hope by now that you caught the Official Trailer and seen the Promotional Posters (but if you didn’t just click those italicized words and they will bring you to see it all). In the other posts I mentioned this was a new property to me, and I still have not managed to catch up. The series is now available for binge watching so have at it but don’t ruin any surprises for me okay. The Premise: On the same day in 1989, forty-three infants are inexplicably born to random, unconnected women who showed no signs of pregnancy the day before. Seven are adopted by Sir Reginald Hargreeves, a billionaire industrialist, who creates The Umbrella Academy and prepares his “children” to save the world. But not everything went according to plan. In their teenage years, the family fractured and the team disbanded. Now, the six surviving thirty-something members reunite upon the news of Hargreeves’ passing. Luther, Diego, Allison, Klaus, Vanya and Number Five work together to solve a mystery surrounding their father’s death. But the estranged family once again begins to come apart due to their divergent personalities and abilities, not to mention the imminent threat of a global apocalypse. Now that the Official Trailer has made sufficient rounds, its time to continue the support of what looks to be a very fun series. If you didn’t see that trailer, please click HERE to bring up that post on a new tab. I’d hate for you to not know what I am talking about after all. Now its time to share a bunch of the promotional posters for the series, and this is something I love to do because its almost the same as the variant cover reveals. Let’s stars with the Official Poster and then onto the ones with the assorted characters. I’ve also added the premise and the casting for good measure so everyone knows who is who. Let’s go. I’ll repeat myself here with the copy I used for the teaser since this is my share of the longer, more official trailer for the upcoming “The Umbrella Academy” series on Netflix. Music fans will know the name of Gerard Way as being a founding member of My Chemical Romance but many might not realize that he has also created an interesting comic book series called “The Umbrella Academy” and now like many other comic book properties, it’s making its way to the small screen with a live action series on the Netflix streaming service. Let’s take a look at the official trailer that was just released. The series will stream in full on February 15th. Music fans will know the name of Gerard Way as being a founding member of My Chemical Romance but many might not realize that he has also created an interesting comic book series called “The Umbrella Academy” and now like many other comic book properties is making its way to the small screen with a live action series on the Netflix streaming service. Let’s take a look at the teaser trailer that was only recently released. It’s once again time to spin that web and swing around New York City with Peter Parker as “The Amazing Spider-Man 2” opens up in theaters nationwide today. 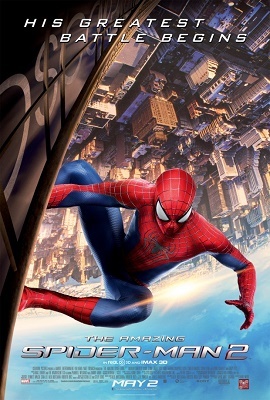 Did you see “Amazing Spider-Man” when it opened in 2012? Did you enjoy it? Let’s discuss after digging into the poster.